In 1991 the North Atlantic Treaty Organization was a nominally defensive military bloc with sixteen members that, as the cliche ran, had never fired a shot. In 1991 the Socialist Federal Republic of Yugoslavia was the only simultaneously multiethnic and multiconfessional nation (entirely) in Europe, consisting of six federated republics with diverse constituencies. By 2009 NATO had grown to 28 full members and at least that many military partners throughout Europe and in Africa, the Caucasus, the Middle East, Asia and the South Pacific. Next month NATO is to hold a summit in Estonia to be attended by the foreign ministers of 56 nations. Last month a meeting of NATO’s Military Committee in Brussels included the armed forces chiefs of 63 nations, almost a third of the world’s 192 countries. By 2008 the former Yugoslavia has been fragmented into six recognized nations (the former federal republics of Bosnia, Croatia, Macedonia, Montenegro, Serbia and Slovenia) and a semi-recognized province of Serbia, Kosovo. 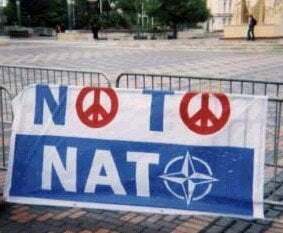 Until the end of the Cold War and the dissolution of the Warsaw Pact and the Union of Soviet Socialist Republics in 1991, NATO had never staged operations outside the territory of its member states. In 2004 it ran eight operations in four continents, including a training mission in Iraq and combat deployments in Afghanistan. The first former Yugoslav republic, Slovenia, was inducted into NATO in that year along with six other Eastern European nations in the bloc’s largest-ever expansion. The Alliance’s first three military operations, however, all occurred in the former Yugoslavia. In 1995 NATO launched Operation Deliberate Force against the Republika Srpska with 400 aircraft and over 3,500 sorties and stationed troops in Bosnia afterward. In 1999 it unleashed the relentless 78-day Operation Allied Force air war against Yugoslavia and in June of that year deployed 50,000 troops to Kosovo. Two years later it sent troops to and initiated the first of several operations in Macedonia following an armed conflict in that country. The three interventions preceded September 11, 2001. After NATO invoked its Article 5 collective military assistance clause following the latter date, NATO Partnership for Peace affiliates as well as full member states started to deploy troops to Afghanistan. After the U.S. and British invasion of Iraq two years following that, soldiers from Bosnia, Croatia, Macedonia and Slovenia were deployed to the war zone in that nation to prove their loyalty as NATO candidate countries. Montenegro did not gain its Western-backed independence until 2006, but has already been levied for troops for the Afghan war. Croatia was rewarded with full membership in 2009 and Macedonia would have accompanied it into the ranks of the world’s only military axis except for the lingering name dispute with Greece. In December of 2008 the complete transfer of contributing states’ troops from Iraq to Afghanistan began and there are now military personnel from five of the six former Yugoslav republics – Bosnia, Croatia, Macedonia, Montenegro and Slovenia – committed to NATO in the world’s longest active and deadliest war theater. In the post-Cold War epoch the former Yugoslavia has been the laboratory for global NATO, its testing ground and battleground, the prototype for the disintegration of nations and for their transformation into economically nonviable monoethnic statelets and Western military colonies. In addition to the Adriatic Charter initiative launched by the United States in 2003, which successfully prepared Albania and Croatia for NATO membership and is currently doing the same for Macedonia, Bosnia and Montenegro with Serbia and Kosovo to follow, the Allied Joint Force Command Naples is the major mechanism for recruiting troops from former Yugoslav republics for wars abroad. Particularly for that in Afghanistan, but the Naples command also operates the NATO Training Mission – Iraq in Baghdad. Serbia, by far the most populous of all former Yugoslav states with more than 7 million citizens, is receiving the most attention from NATO at the moment. Last year the pro-Western government of President Boris Tadic signed an Individual Partnership Program with NATO. On the same day, and to provide a blunt indication of what further NATO integration means, a Serbian news source disclosed that troops from the nation are being readied for peacekeeping deployments in Uganda, Lebanon and a third nation as yet unidentified. Serbian soldiers are inching ever closer to the Afghan war theater. But not with the support of their countrymen. In tandem with moves to drag Serbia deeper into the NATO nexus despite widespread popular opposition, Brussels and Washington are consolidating their hold on the other three former Yugoslav republics not yet full NATO members: Bosnia, Macedonia and Montenegro. A senior official in Bosnia’s Foreign Ministry announced that “We expect that Bosnia will be invited to join [the] MAP in Tallinn,”  a reference to the NATO foreign ministers meeting in Estonia on April 10. Earlier this month the chairman of the Council of Ministers of Bosnia and Herzegovina, Nikola Spiric, visited NATO headquarters in Brussels to meet with Rasmussen and to address the North Atlantic Council. On March 22 NATO’s KFOR launched five days of exercises throughout Kosovo in conjunction with the European Union’s EULEX (European Union Rule of Law Mission in Kosovo) and the separatist Kosovo Police Service (KPS). The drills are headed by NATO commander Markus Bentler. In 1991 the Socialist Federal Republic of Yugoslavia, and from the following year onward the Federal Republic of Yugoslavia, presented an obstacle to NATO’s drive to the east – the former Soviet Union and Asia – and to the south – the Middle East and Africa. In the story of Aesop’s a bundle of sticks tied together could not be broken but, once separated, each could be easily snapped in two. In completing the fragmentation of Yugoslavia NATO removed a crucial impediment to its expansion into a global military force. In its place it has acquired seven new members and candidates and as many potential sites for training camps, air and naval bases, and transit points for moving troops and weapons to new war zones on three continents and in the Middle East.